Don't be fooled by the sales technique seminars, your sales performance is directly linked to the amount of deleicious handmade chocolate you give to your customers! Fact: You're in for a good year if you choose a Large Aine Corporate Selection Box. 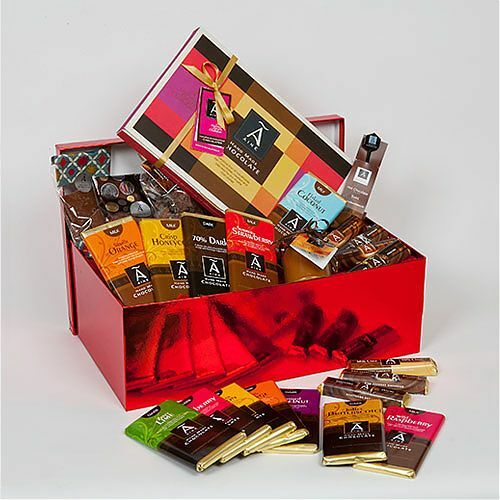 Includes a box of twenty-eight hand made chocolates; two bags bursting with truffles, five fabulous 50g bars of hand made chocolate heaven; two bags of broken chocolate, a box of indulgent Irish Creme liequers (6 sweets); four Hot Chocolate Swirl Sticks, two bags of buttons and six 100g bars of smooth milk chocolate and delectable dark chocolate.